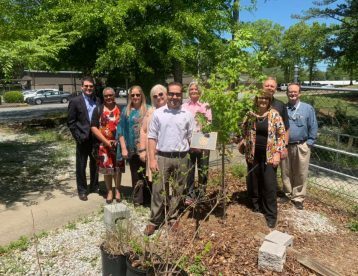 Rotary Club of Lawrenceville visited Creative Enterprises on Earth Day to install a plaque for the trees they planted commemorating Rotarians. 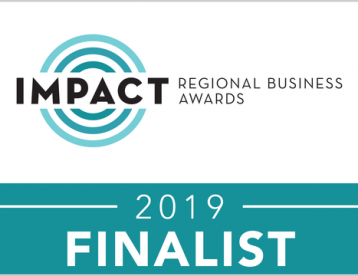 CREATIVE ENTERPRISES, Gwinnett designated as finalist in Gwinnett Chamber IMPACT Regional Business Awards Gwinnett County (METRO ATLANTA) GA – Recognized as a leading organization, Creative Enterprises has been designated as a finalist for the IMPACT Regional Business Awards. Get ready for Spring! 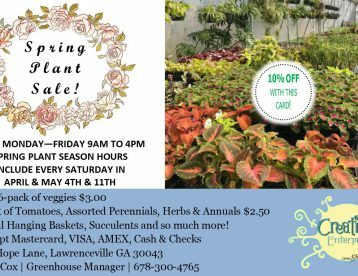 Our 2019 Plant Sale starts Saturday, April 6. For the safety of our clients and staff, when the county schools are closed or delayed for hazardous road conditions, Creative Enterprises will be closed. Get ready for Spring! Our 2019 Plant Sale starts Saturday, April 6. See our 2019 Price List. Creativity has been the cornerstone of our operations defining our culture of providing a wide spectrum of programs and services that allow persons with disabilities, and other barriers to employment, the opportunities to explore a variety of offerings that fulfill, challenge and encourage them to excel. 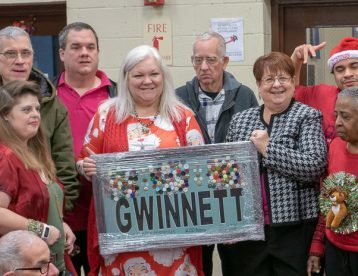 We are so very grateful to all of our supporters who help us provide employment training and other meaningful activities that enrich the lives of those enrolled in our programs. Whether financial contributions or donations of goods or services, they all help us complete our mission. Please see our Contribute page for more ways to donate including a list of needed goods or services and further information to coordinate a donation. © 2018 Creative Enterprises, Inc.
Creative Enterprises is a 501(c)(3) not-for-profit that operates a Community Rehabilitation Program providing employment and life skills training to adults with disabilities by offering on- and off-site work programs, job placement assistance, educational and creative programs, and a variety of additional resources to help maximize individual potential, empowering them to shine with their own unique creativity.